Background: Neo-angiogenesis, a key step in cancer progression, is a highly regulated process, in which Vascular Endothelial Growth Factor (VEGF) plays a fundamental role, thus representing the most suitable anti-angiogenic target. In the last year, a number of anti-VEGF drugs have been developed and approved for therapeutic use, especially in combination with standard chemotherapy. 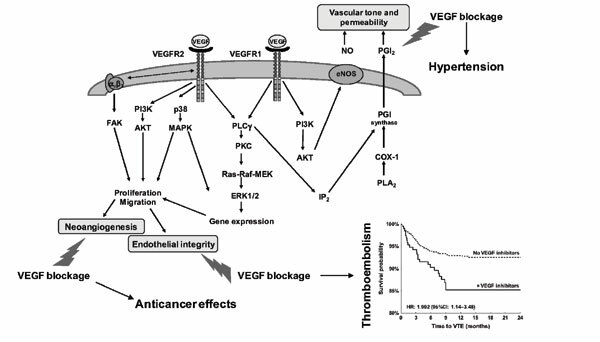 VEGF, however, is not only crucial for physiological and pathological angiogenesis, but also for the maintenance of vascular homeostasis, at a point that its pharmacological blockade may lead to endothelial dysfunction and adverse vascular effects, such as venous thromboembolism. The picture is further complicated by the understanding that the amount of VEGF production is influenced by genetic factors, with environmental ones accounting only for 20-30% of its variations. This has recently prompted the design of various pharmacogenetic studies to investigate the role of VEGF polymorphisms in determining the pharmacological response and safety profile of various anti-angiogenic drugs, suggesting that the analysis of VEGF genetic variants in cancer patients may further help personalize anti-angiogenic pharmacological strategies. Conclusion: In this review, we initially focused on the biological mechanisms involved in vascular maintenance and angiogenesis. Then, discussed the efficacy and toxicity profile of some of the antiangiogenic drugs most commonly used in the treatment of solid cancer, with a particular focus on the thromboembolic complications of anti-angiogenic treatments in cancer patients. Finally, the impact of VEGF gene polymorphisms on clinical outcome and toxicity was briefly reviewed. Vascular endothelial growth factor, anti-angiogenic drugs, bevacizumab, tyrosine kinase inhibitors, thromboembolism, solid cancer.